Aspen prepared an Environmental Assessment and supporting documents, including a Biological Evaluation/Biological Assessment and Management Indicator Species Report, for the proposed Lincoln Avenue Water Company (LAWC) Project located entirely within the boundaries of the Angeles National Forest. 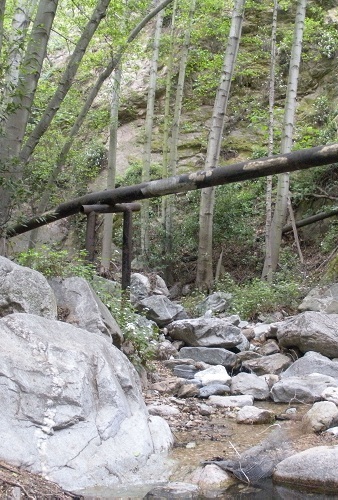 The project consisted of two components, including the renewal of Special Use Permits (Water Transmitting Pipeline and Water Diversion/Weir) in support of ongoing operation and maintenance of existing LAWC equipment and facilities on National Forest System lands and the replacement of approximately 1,400 feet of damaged 10-inch steel pipeline located along Chaney Trail Road, just southwest of the trailhead to Sunset Ridge Trail in Millard Canyon. Existing equipment and facilities consist of water pipelines, gauging meters, the North Coulter Reservoir, weirs, and diversion structures all located within Millard and El Prieto Canyons. The project was needed in order for LAWC to continue to provide a reliable source of water to its customers. Aspen also prepared an operation and maintenance plan for LAWC and regulatory permit applications in conformance with CDFW, USACE, and Regional Board requirements.